Four young men find themselves transported into a massive, online, role-playing game in this fantasy debut. Dangalf works at the state unemployment office. His expensive and prestigious college degree remains unused and he hates his job, which offers no creative outlet and saps his individuality. He lives only to play Cronica, a fantasy computer game in which he interacts with other players to complete missions. Dangalf, his roommate Doppelganger, and two others—Elftrap and Nerdraaage—form a team called the Keepers of the Broken Blade. One morning, after a typical long night of button-mashing, Dangalf wakes to a pigeon crashing into his bedroom window. In the kitchen, he and Doppelganger learn that there are two pigeons vying for their attention. The birds carry messages stating: “Heroes, seekers, mercenaries, and adventurers, a quest awaits you!” This prompt matches the one in Cronica. The roommates drive to a secluded wood and find an inn that could have popped up from the game. They also meet in person, for the first time, the young men who play as Nerdraaage and Elftrap (the latter being a handsome guy despite using a female avatar). After detecting four gold coins inside the inn, they drop them into a well outside. The players wake up—in the bodies of their fantasy characters—in a place they recognize as Acadia. For his tale, Deering appeals to readers who have enjoyed The Lord of the Rings series and gamers hooked on World of Warcraft. He doesn’t shy away from the pointed analysis that “Cronica provided...camaraderie, discovery, conquest, and honor,” things that most players “found lacking” in real life. 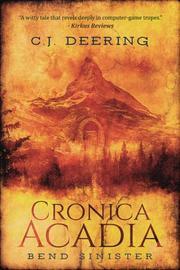 Much of the novel, however, unfolds like a video game, with dwarf, elf, and human characters completing tasks suited to their paths of achievement (slaying dire wolves, for example). While clever, this makes the narrative feel cloistered, for the operations overshadow the mystery of how the heroes arrived in Cronica. Still, the subplot involving Dangalf’s romantic obsession with Elftrap (or Ashlyn, as she renames herself), as well as the machinations of the villain Regicide, should have fans swooping back for the sequel. A witty tale that revels deeply in computer-game tropes.